Città di Kyoto (City of Kyoto) was created to commemorate “the 40th anniversary of the sister-city relationship between Florence and Kyoto”; it combines iris, the symbol of Florence, and lotus, the sacred flower of Kyoto. Rather irrationally, instead of bothering to look at the list of notes, I drew a mental parallel between this new fragrance and Comme Des Garcons Series 3 Incense Kyoto and expected Città di Kyoto to be an incense-based scent. In reality, I smell no incense whatsoever in Santa Maria Novella’s new creation. This is a Green Floral Woody perfume that could easily have been called Bois de Jacinthe or Jacinthe de Bois, because hyacinth and woods are the most prominent players in this composition. Hyacinth is especially evident in the beginning. It is a green and dry note, elegant and austere. It never disappears completely on my skin, but it does become softened by other flowers. The iris note is lovely here, gently rooty and velvety. Hawthorn is at its most attractive, it smells nutty, almost suede-like to my nose. There is also a discreet hint of fruits (plum and peach), which, together with vanilla, further softens and sweetens the composition. The hyacinth note becomes very apparent yet again in the drydown; the combination of the green hyacinth and the dark, resinous accord of cedar, sandalwood, ebony and ambergris is quite striking and, to me, the best part of Città di Kyoto. All in all, I found Città di Kyoto to be an arresting, stylish fragrance that is bound to appeal to the fans of dry, green florals along the lines of Caron Violette Precieuse or Maitre Parfumeur et Gantier Iris Bleu Gris. 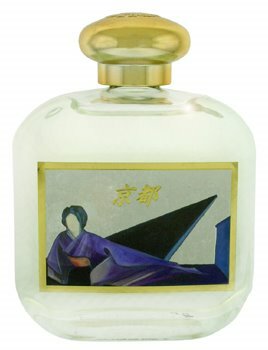 Città di Kyoto is available at Aedes, $84.00 for 3.3oz. Wow, I get a COMPLETELY different scent, went upstairs and put some on after reading your review... on me it's faintly sweet for maybe 15 seconds, then it's all bone-dry -- Japanese stick incense in a sandalwood box. Zero hyacinth (or any floral, really.) I'm glad, because I love it just the way it is! I am usually not a fan of that note at all, but here somehow hyacinth really works for me. I wish I got some incense too! But I keep reading it has incense!! No matter, a dry green fragrance sounds lovely anyway so I will have to try it. In so many reviews I read about the incense in Citta...nothing on me. I think however you might actually like this one anyway, incense or no incense. I would love to know what you think about it (and whether you do get icnense). I am so glad it is working properly now. All is well that ends well. My humble Blogger template did not prepare me well for posting on your sophisticated site. You have some great tools and...things there. This one is really dry on me, but I like the way it smells better now than it did in the dead of winter. Dryness of skin, I bet. It's now less incensey (and I do get incense) and a little more floral, which makes it pretty nice. Though I do like Citta the way it is on my skin too. Your differing take on this one makes me want to try it more than if it were an incense fragrance, since I like arrestingly stylish dry florals. mmm. Thanks for the review. So nice to have you back! I hope you enjoyed your time in Paris and feel better now after your cold.